This book review was originally posted at my myspace account blog in 2007. Many posts were lost there. Godin, S. (2007) The dip: a little book that teaches you when to quit (and when to stick). New York: Penguin Group. Seth Godin (2007) argues that people must quit “something” in order to become the best in his 2007 book, The Dip. Godin (2007) suggests that a person must quit things or activities and make sacrifices in order to become the best at one thing. Here is an example: Tony Hawk, the most prominent and well-known professional skateboarder quit playing baseball at the age 14. This was a tough choice because Hawk’s father was the president of the little league (StarPlus, 2008). Tony Hawk was considered “the best” skateboarder in the world at age 16 (Hawk, 2008). Hawk has entered 109 professional contests and has won 73 and placed second in 19. Today, he has his own line of clothing, skateboards, and skateboard videogames are named after him. Godin (2007) reports that number 1 is rewarded ten times that of number 10. There is evidenced of this everywhere: ice cream sales, bestselling books, movies at the box-office, and models on the covers of magazines. The best get the rewards. Being the best recreational therapist would open up opportunities. Those with the best experience, skills, and training on their resume will land an interview. Those with mediocre skills and abilities will get screened out before an interview. Godin (2007) suggests seven reasons why people give up on becoming the best in the world. g.) lack of talent or skill. Have you lost the interest in your profession? Are you truly committed to your profession? Are you still willing to develop your talents and skills? Never, never, never give up” is bad advice for the salesperson who sales music on cassette in the age of iPods. Quitting a “dead-end-path” is a good choice. Quitting Medical School could be a good choice. Godin (2007) points out that best-selling author Michael Crichton, a graduate from Harvard Medical School quit his career as a doctor in order to follow his passion and interest in becoming an author. Example: I, Danny Pettry, quit Nursing School in order to become a Recreational Therapist after observing Recreational Therapists at a Rehabilitation Hospital as part of a 40-hour volunteer requirement to apply to nursing school. It was a decision I’ll never regret. c.) The Cliff: Godin (2007) claims that this is rare. It slowly raises and then suddenly falls. This is rare. Godin explains that no one quits the marathon when she sees the finish line. a.) Are you settling for being the mediocre recreational therapist? b.) 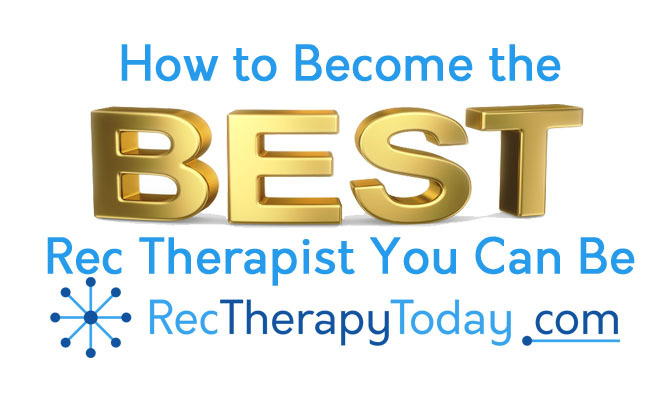 Are you working towards becoming the best recreational therapist you can be? Danny Pettry’s suggestion — Find some time to learn and grow. Give up a Netflix binge or give up watching a rerun if you have to. Find some time to learn and grow. What Next? Click on the red button below. Click here for self-study CEUs — helpful and convenient to use. Learn. Grow. Be your best. Godin, S. (2007) The dip: a little book that teaches you when to quit and when to stick. New York: Penguin Group. Nightingale, E. (2000). Earl Nightingales’s (1956)The strangest secret. [digitally re-mastered audio CD]. Nightingale-Conant. Putnam, R. (2000). Bowling alone: the collapse and revival of american community. Simon & Schuster. Riley, B., and Connolly, P. (2007, March) Growth and retention of new graduates in the profession of recreational therapy. Presented at the American Therapeutic Recreation Association (ATRA) mid-year conference. Washington, D.C.
Schroder, F. (Director), Campbell, D. & Maravich, P. (Writers). (1991). The pistol: the birth of a legend. [Motion picture]. United States. L.A. Film Partners. StarPlus. (2008). Tony Hawk Biography. Retrieved [May 27, 2008] online: http://www.starpulse.com/Athletes/Hawk,Tony/Biography.